The Doom That Came to Sarnath—Hate, genocide, and a deadly curse consume the land of Mnar. The Cats of Ulthar—In Ulthar, no man may kill a cat...and woe unto any who tries. 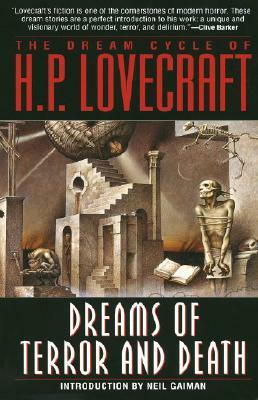 The Dream Quest of Unknown Kadath—The epic nightmare adventure with tendrils stretching throughout the entire Dream Cycle. And twenty more tales of surreal terror! Almost completely ignored by the mainstream press during his lifetime, H. P. Lovecraft has since come to be recognized as one of the greatest writers of classic horror, on a par with Edgar Allan Poe, Lovecraft's mentor. H. P. Lovecraft's work has been translated into more than a dozen languages, his tales adapted for film, television, and comic books, and he has been the subject of more scholarly study than any other writer of horror fiction save Poe. Neil Gaiman used to be a journalist, but gave it all up to write comics, which he claims are a totally valid late-twentieth-century art form, and he’s even won awards for them, so that’s all right. He’s 5’11” tall, owns a number of black T-shirts, and although he’s not overly keen on banana daiquiris, is always very flattered when appreciative fans send him money (he’s read Terry Pratchett’s biography, and, although he doubts that this will have any effect, figures what the hell).